If you would like to sing in a choir come and join Bingham and District Choral Society. We sing three concerts in each season, which starts in September. We don’t hold auditions – if you can read music it will make it easier for you, but we welcome anyone who is keen to sing! Our rehearsals take place between 7.15pm and 9.30pm on WEDNESDAYS during school term time, at CARNARVON PRIMARY SCHOOL, Nursery Road, Bingham. Our concerts are in November, December (our Christmas special) and May. The best time to join is when we start to rehearse new works, usually in September and January. New members are invited to try us out for three weeks free of charge. If you are unsure, or haven’t sung in a choir before, we have a mentor for each singing part, who can help to get you orientated. Our annual subscription is £95 (which can be paid in two instalments). We are particularly keen to encourage younger members to join, so there is a special subscription rate of only £1 for those in full time education. Music can be hired for a nominal fee. 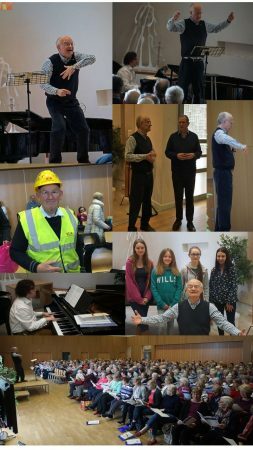 In addition to our musical activities, we enjoy a range of social activities which help us to raise funds so that we can continue to afford professional soloists and orchestral support for our concerts. choir@binghamchoral.org.uk or ring Valerie Morgan (Choir Secretary) on 0115 933 2353. Rehearsals take place on Wednesdays at 7:15pm, Carnarvon Primary School, Nursery Road, Bingham. 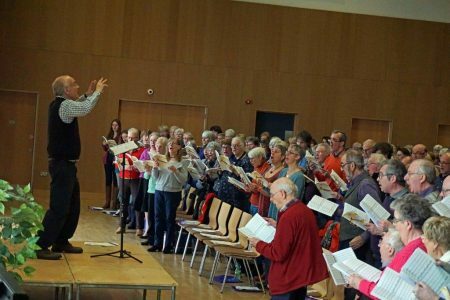 If you have always wanted to join a choir then why not come along and see how rehearsals work. If you don’t know what voice part you sing we can quickly establish that so we can make sure you are sitting with others in the same voice range. We are always short of Male tenors! Singing with Bingham was my first experience of classical choral music. I didn’t know what voice I had, and it was suggested by other members, correctly that I should be a bass. Initially, I found the Latin words difficult to pronounce and incomprehensible, but I enjoyed the sounds and making the sounds, singing. I began to learn what music is about, and how much fun, and how rewarding it is to perform pieces that are not always easy, but sound wonderful. For those thinking about joining, we like to give new members a warm welcome. If anyone finds them selves struggling, or confused by anything, please speak to me, a member of the committee, or whoever you are singing next to. If one of us does not know the answer, we will find someone who does. If you feel at all uncertain about singing, please give Bingham a try. We do not audition, we want our music to be available to everyone. Members usually know when they are out of key, and can correct that bit of music without feeling awkward. We would love to see you, any Wednesday evening during school term time from September to May. Saturday May 11th 2019 at 7.30 in St Mary’s, Radcliffe-on-Trent the choir is joined once again by the pianist Caroline Clemmow, who has a long association with the choir for a programme of English Music. The programme will include a world premiere of a recently discovered setting of Psalm 23 by Eric Thiman (1900 – 1975). 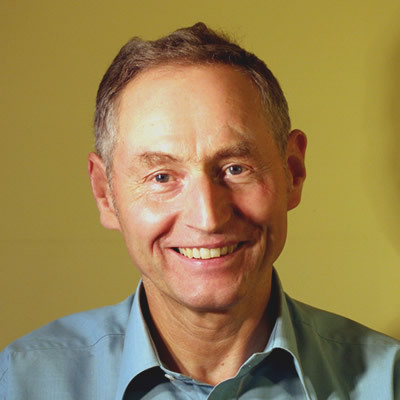 The choir will also sing extracts from Elgar’s tuneful and rumbustious Songs from the Bavarian Highlands, plus Guy Turner’s Under the Wide Sky, setting of poems by Robert Louis Stevenson. The programme will culminate in a performance of John Rutter’s The Sprig of Thyme, a sequence of beautiful arrangements of Folksongs. Spring Concert: Thiman, Psalm 23; Turner, Under the Wide Sky; Rutter, Sprig of Thyme; Elgar Three songs from the Bavarian Highlands, Butterworth, Bank of Green Willow (piano). Soloists: Harriet Astbury (soprano), Matthew Keighley (tenor); Caroline Clemmow (piano). Accompanist: Caroline Clemmow. Conductors: Guy Turner and Edward Turner. 7.30pm at St Mary’s Radcliffe on Trent. 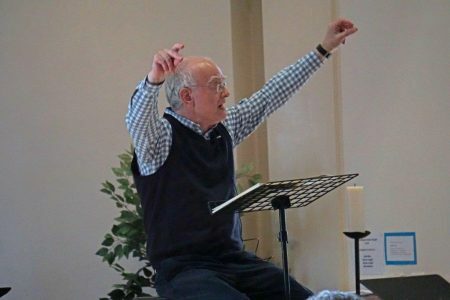 Folk songs including extracts from John Rutter’s Sprig of Thyme and songs from Zimbe by Alexander L’Estrange. Autumn Concert: Buxtehude Magnificat; Purcell Welcome to all the Pleasures; Vivaldi Magnificat; Handel O Praise the Lord. We have got to know Ellie Martin and her dynamic, engaging style of conducting through recent joint performances with Mansfield Choral Society where Ellie is Musical Director. We were therefore delighted when Ellie agreed to run our annual BDCS Singing Day this year. 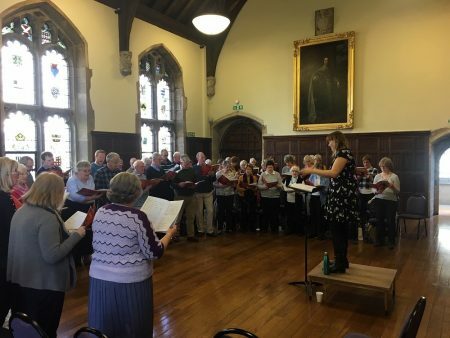 It took place in the beautifully renovated State Chamber at Southwell Minster during a spell of extraordinary sunny and warm weather. This put everyone in an upbeat mood, which was enhanced during the day by Ellie’s choice of music: Zimbe by Alexander L’Estrange and English Folksongs. While we were reasonably well-acquainted with the latter, Zimbe took us out of our choral society comfort zone with its African texts, infectious rhythms and complex harmonies. Everyone seemed to find the challenge exhilarating. ‘Very enjoyable – and exhausting!’, said one participant. We are very grateful to Ellie for creating a great learning experience and making it such fun, to Angela Foan, our excellent accompanist, and to Alex Patterson who gave us valuable solo support. Marcus Farnsworth provided great insight into singing technique, in particular the importance of breathing correctly, posture, relaxation, and pronunciation. It was a challenging day with two works in German and one in Latin so we had the duel challenge of sight reading sacred pieces that most were unfamiliar with whilst harnessing our choral technique. The day was structured around J.S. Bach’s ‘O Jesu Christ, meins Lebens Licht’ (Lord Jesus Christ my life and life); Brahms ‘Geistliches Lied’, and Edvard Grieg’s ‘Ave Maris stella’ (Hail, bright star of heaven). The day concluded with a short performance of the three works to a small but appreciative audience of friends and family who had come to support the participants. Our thanks go to accompanist Ed Turner for his accomplished playing, Guy Turner for being Master of Ceremonies, and of course Marcus Farnsworth for a superb signing experience. (Photographs courtesy of Ira Unell).